Culinary historian and soul-food scholar Adrian Miller dispels rumors about the origins of chicken and waffles (sorry Harlem), and explains why red is an important flavor—not just a color. Adrian Miller, author of the James Beard award-winning book Soul Food: The Surprising Story of an American Cuisine, One Plate at a Time, wants to set the record straight: “Southern food is the mother cuisine that soul food claims heritage to, but soul food is distinct unto itself.” Through tireless scholarly research, Miller has made it his mission to unravel myths and pick apart misconceptions that seem to follow the cuisine. Part of the confusion surrounding soul food, he explains, stems from cultural stiff-arming that occurred in the 1960s. Even tracing the etymology poses problems. 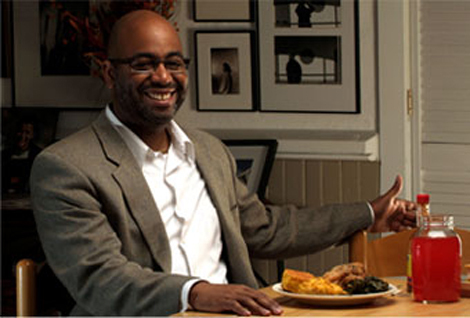 According to Miller, conventional wisdom says that soul food was coined in the 1960s as part of the Black Power movement. But in the ’40s, disgruntled black jazz players were already invoking the word “soul” while channeling a new gospel sound, eventually applying it to other aspects of black culture (“soul brother”). Even further back, you can trace the term soul food to Shakespeare’s first play The Two Gentleman of Verona, when two female characters reference an attractive male. Soul food was purely religious in this context, considered anything that could edify your life. “Soul food is in flux right now, especially outside of the South,” says Miller. Traditional places are having a generational moment. The people who started them are retiring, or dying off, but the kids in the family and other employees are still interested in carrying on the business. Despite our assumptions about the cuisine—that chicken and waffles, for instance, originated in Harlem (false)—there is still much to uncover about its past. From a “red” West African drink that inspired the Coca-Cola owner’s empire, to the real truth about chitterlings’ “left-over” status, here Miller dispels common myths, and cuts to the core of what soul food is really all about. 1. Soul food and southern food are the same thing. Miller says: Soul food is really more about what African Americans are eating outside of the South—it’s an immigrant cuisine. If you look at what Americans describe as immigrant foods, it’s usually special occasion food of the immigrant’s home country. 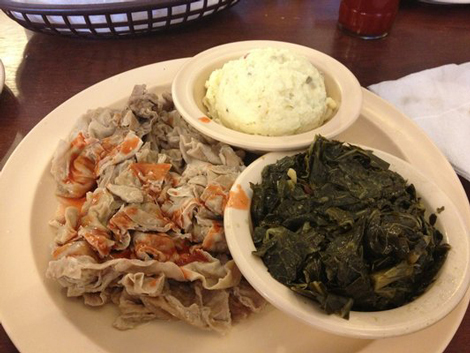 Much of what we call soul food is the celebration food of the rural South. Fried chicken, fried fish, cakes, cobblers and pies—all that stuff was meant for celebratory occasions, not everyday eating. Inside the South, the lines between Southern and soul are blurred because of common heritage. But the distinction sharpens once you leave the South. There will obviously be overlap, but in the South, one key difference is how the food is seasoned. A perfect example is Nashville hot chicken, which was created in a soul-food joint, but it is now showing up on menus across the country. Soul food is also more likely to feature variety meats like chitlins, oxtails, and pigs’ feet. 2. 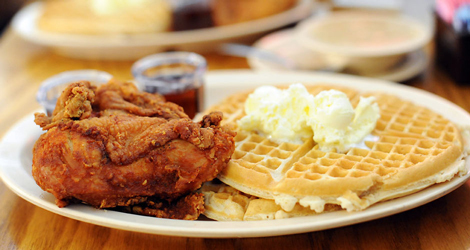 Chicken and waffles were invented in Harlem. 3. Only African Americans can make good soul food. Miller says: Anyone can make good soul food, as long as they’re true to its traditional flavor profiles and preparation techniques. Again, a lot of it comes down to seasoning and the expectations of those eating the food. Soul food tends to be more intense than its Southern food counterpart—fattier, saltier, spicier, and sweeter. Greens is an example of a popular crossover soul food and Southern dish. When I make greens (collard, kale, mustard, or turnip), I season with onion, garlic, and red pepper and I get a smoky flavor from smoked turkey or ham hocks. Without that seasoning, I would find it less soulful. If soul food is to survive and grow in popularity as other ethnic cuisines have, it has to be accessible to people outside the black community. People have to be comfortable enough to dine at soul-food restaurants make soul food at home. 4. Red is just a color. Miller says: No…it’s a flavor! In the soul-food tradition, we don’t get caught up in describing something as as cherry, strawberry, or tropical punch—you just say it’s red. It’s the official soul-food drink, and if a place doesn’t offer it in some form, the restaurant is automatically suspect to me. Two traditional red drinks from West Africa cross the Atlantic during the slave trade. 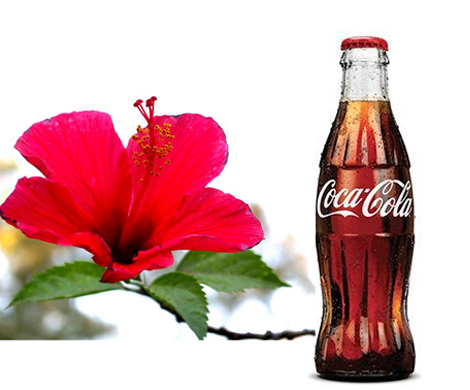 One of them is hibiscus, which is a flower native to West Africa. It gets transplanted in the Jamaica colony where it’s called “sorrel,” and eventually makes its way around Latin America where it is called agua de Jamaica (Jamaica water). The other traditional West African red drink is cola. Though Americans are used to cola drinks dyed brown, red and white cola nuts are used to make teas. The cola nut was considered a wonder drug during the late 1800s and was utilized by slave masters. Enslaved workers were given cola nuts for an energy boost and also to make their bitter water rations more palatable. Because of the cola nut’s wonder drug reputation, it was natural for John Pemberton to pair it with cocaine—the other wonder drug of the time—when he invented Coca-Cola. 5. Cornbread shouldn’t have any sugar. Miller says: This is a huge issue for Southerners. They believe that it should not have any sugar at all. If it does, it has crossed the line and become cake. I can tell you as a matter of fact—most soul-food cornbreads have some amount of sugar, whether it be a tablespoon or a cup. My research shows that as African Americans left the South, the white cornmeal they were used to wasn’t as available as yellow cornmeal. The industrially milled yellow cornmeal wasn’t as sweet as the watermill-ground white cornmeal. So, they started adding sugar to compensate. Southern food changes once it leaves the region, and a lot of the time you have to substitute and improvise. So if you can’t get white corn meal freshly milled and can only get your hands on processed stuff, you have to figure out a way to kick up the flavor that will remind you of what you ate at home. That’s the immigrant cook’s plight. 6. Chitterlings (“Chitlins”) were the master’s leftovers/unwanted food. 7. Soul food is unhealthy. Miller says: If you actually look at rural roots of soul food in the antebellum South, it was a cuisine primarily based on seasonal vegetables, and very little meat was eaten. Meat was typically used to flavor the vegetables, which fits into a culinary framework from West Africa, where dried, salted, or smoked fish was often used to one pot meals. Frying was for special occasions, so their food tended to be baked, boiled, or eaten raw. Think about what nutritionists are telling us to eat: dark leafy greens, sweet potatoes, legumes, and fish. These are building blocks of soul food! In the antebellum South, the enslaved were pretty much fed water, vegetables with little meat; prestige foods were only served during special occasions on weekends, when the work schedule slowed down. Because of the shift in tempo, you could do more elaborate cooking using more prestigious and processed ingredients like butter, refined flour, sugar, and whole milk rather than the whole-wheat flour, molasses, and buttermilk that was more readily available. The diet is closer to what we now call vegan. Soul food’s unhealthy reputation grows when more celebration foods and processed foods enter the diet as people become more prosperous. Quite naturally, if you have more disposable income, you start eating the good stuff more often; thus, celebration food becomes more commonplace. This is further compounded by eating more fast food and industrialized food. To me, that’s a bigger factor of perceived health problems in the African American community, more so than soul food. 8. Yams are not sweet potatoes. 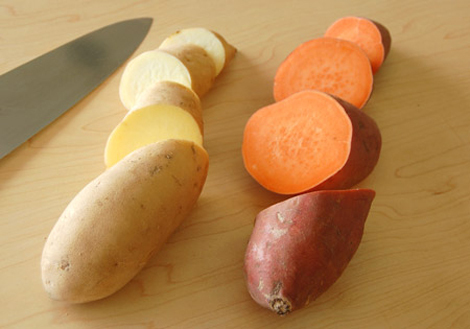 Miller says: Yams are dark-fleshed sweet potatoes—not the tropical yam. In the late 1800s, farmers were experimenting to create sweet potatoes varieties with a darker color and a higher sugar content. Yellow and orange were the most popular hues. In a stroke of marketing genius, sweet-potato farmers started calling their product “yams.” That’s why one can walk in a grocery store and see a bins of sweet potatoes and yams side-by-side and think that they’re two entirely different foods.The word yam has linguistic origins in West Africa where it means “to eat.” It was probably a colloquial term that was floating around in the antebellum South and interchangeably used with “tater” as a nickname for the sweet potato.